In “The Raid,” Supernatural picks up where “Family Feud” left off. Sam and Dean are still absorbing the news that their mom is working with the British Men of Letters. The conflict between Mary and her sons is brought to screen beautifully by writer Robert Berens and director John MacCarthy. The strain among the Winchester clan underlies the tension between the British Men of Letters and the American hunters. If you think vampires are scary, wait until you get a load of Dean Winchester hurt by his mother’s betrayal. The scene in which Mary faces off with Sam and Dean at the bunker is one of the most powerful scenes in Season 12 of Supernatural. Mary is trying to convince her sons that the British Men of Letters is the better way, but they’re not buying it. Dean emotes anger and disappointment, while Sam’s expression is all hurt and sadness. Dean’s response is heartbreaking, hearkening back to the childhood flashbacks we’ve seen throughout the series. Jensen Ackles reaches deep, portraying the pain and fury that can only be caused by family or God. Jared Padalecki plays the role of a wounded son, confused by his mother’s action. Samantha Smith portrays Mary with a combination of compassion and righteousness, proving that she really is Sam and Dean’s mom. She’s not the only one feeling righteous. We finally have an outlet for the annoyance and disappointment we’ve been feeling all season about Mary Winchester as a mom. It’s not a complaint with the overall story arc, as her detachment and eventual betrayal is meant to amp up the tension. Eventually, we learn that Mary is fighting for a different future for her boys. She wants a world without monsters so they can have a different kind of life, the kind of life Sam was heading towards before he left Stanford. Lest the good looks of Arthur Ketch, played by David Haydn-Jones, disarm the viewer, we’re reminded that he’s at best a cad, and at worst, a barely contained serial killer. After all, the name Ketch may be a reference to the 15th-century executioner Jack Ketch, a name synonymous with death and the devil in English tales. Ketch is certainly taken with Mary, whom he believes to be the best hunter amongst the Winchesters. Yet the mysterious “old men” of the British Men of Letters, who earlier unleashed Lady Antonia on the Winchesters, still want Sam and Dean recruited. Despite all the technological advantages of the British Men of Letters, the Winchesters often have the upper hand. Dean doesn’t need a fancy gun like Ketch’s to kill vamps, preferring a beheading blade. The Brits have inaccurate intel on the alpha, while Sam has actually met him. The British Men of Letters may have the Colt, but can’t use it without bullets and Sam knows how to make them. When the British base is under attack it’s the Winchesters who must protect everyone. At first, it appears that Mary and Ketch are using a divide and conquer strategy, with Mary inviting Sam to the British Men of Letters’ temporary base while Ketch attempts to win Dean over with a bottle of scotch at the bunker. Then everything starts to fall apart. Sam is surprised to learn that Mary stole the Colt from Ramiel, looking at the weapon in a way that brings to mind Azazel and Lucifer, as well as John Winchester. Seeing Sam and Mary working together to protect the base is very fun to watch, both because the attack creates great drama and because we’ve never seen the two of them fighting monsters without Dean. Bringing back the alpha was a stroke of genius. Though we’ve been enjoying Rick Worthy in The Magicians and The Man in the High Castle, some of our favorite shows featuring Supernatural alum, his return to Supernatural was long overdue. Director John MacCarthy, who has been with the series since the first episode, and editor James Picket use an interesting technique to reveal part of the story. During the standoff at the base, “The Raid” uses some fantastically edited shots to show us what even the alpha failed to notice at first, reminding us once again why Supernatural is one of the most innovative shows on television. “The Raid” also features some gory but comical vampire corpses. A huge new set is created to serve as the British Men of Letters’ temporary base. It has a Doctor Who meets 24 look to it. Let’s hope it gets used again. There are bookend moments in “The Raid” that reflect both closure and change. When Sam encourages Dean to talk to his mother, Dean complains that Sam is always playing the peacemaker and needs to pick a side. During a standoff at the British Men of Letter base, Sam uses that same terminology when he claims he wants only to protect himself and his mother. By the end of the episode, Sam has picked a side in the argument between Mary and Dean, even if Dean doesn’t know it yet. The British Men of Letters trundle up the hunter who betrayed them. Sam and Mary’s somewhat surprising agreement of his treatment reflects how Sam has come along to Mary’s way of thinking by the end of the episode. “The Raid” is a riveting story with a great monster villain, connections to earlier seasons of the series, and powerful emotional moments. 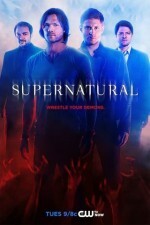 It’s the first British Men of Letters episode of Supernatural we really enjoyed from start to finish. Though Sam was surprisingly quick to warm up to the Brits’ way of thinking, it may create some interesting new Winchester family dynamics. Jensen was just amazing in that first five minutes in the family meeting in the bunker. We’ve never really seen that precise flavor of hurt and anger from him, and it was really something to see. In the British Men-of-Letters good or bad debate, it’s hard not to recall Mary’s torture-killing of a rougarou a few episodes back, trying out new BMoL-developed weapons in a controlled environment. That and Sam’s treatment in the beginning of the season. It’s hard to know what to make of Sam’s change of heart.